Lua error in Module:Location_map at line 488: Unable to find the specified location map definition: "Module:Location map/data/Missouri" does not exist. 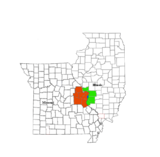 St. Louis is a large and major city in the U.S. state of Missouri. It is by the Mississippi River. It was founded by the French. It was named after King Louis IX of France, who is also a Saint. It is often called the "Gateway City" because it was important to settlers traveling out west. Its most famous landmark is the Gateway Arch. St. Louis has a hot-summer continental climate (Dfa in the Köppen climate classification) and experiences four distinct seasons. Summers are often hot and humid with temperatures in July between 70 and 90 degrees. St. Louis is famous for a number of dishes made local such as toasted ravioli and pork steaks. St. Louis has two major sports both playing in the downtown area; the St. Louis Cardinals of Major League Baseball, and the St. Louis Blues of the National Hockey League. St. Louis had a National Football League team from 1995 to 2015, named the St. Louis Rams, which moved back to Los Angeles, California after that season. There are many colleges and universities in and around St. Louis. Some of these are Washington University in St. Louis, Saint Louis University, Fontbonne University, and Lindenwood University. ↑ "Visiting the Gateway to The West". Globosapians. Retrieved 2008-05-15. ↑ "St. Louis City, Missouri - Population Finder - American FactFinder". U.S. Geological Survey. 1980-10-24. Retrieved 2008-12-23. This page was last changed on 3 August 2018, at 13:07.